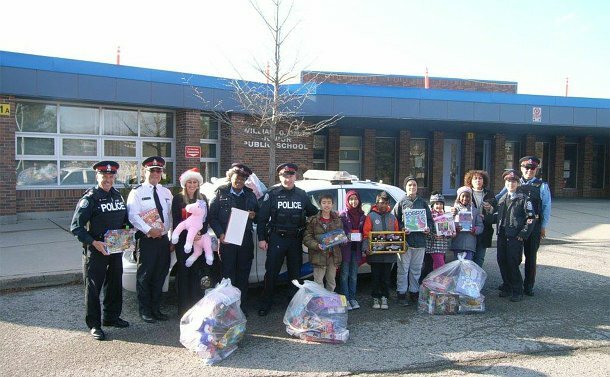 On Thursday, December 17, Auxiliary officers from 41 and 42 Divisions, attended at William G. Davis Public School, to receive dozens and dozens of new toys donated by staff and students. The school wanted to give back to the community and over 125 students took part in the initiative and brought in new toys for needy families and their children. The toys were presented to the Auxiliary officers for the Auxiliary Toy Drive and toy giveaway, on Saturday, December 19. The toy drive in the school was organized by Sonia Sotiropoulos and Principal Shirley Ponka and the students were more than enthusiastic to participate. Superintendent John Tanouye was joined his police and Auxiliary officers in receiving the donations from school Principal Shirley Ponka and the generous students.